Heat Up the Summer at the Hottest Pro AM, the Atlanta Entertainment Basketball League, For Their 4th Season This July! 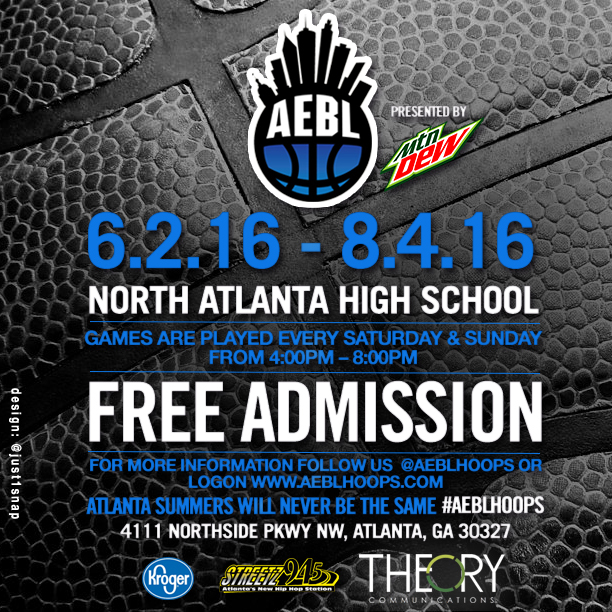 Atlanta, GA. 15 June 2016 – Atlanta Entertainment Basketball League(AEBL) has partnered with Mountain Dew™ to bring back another season of live hoops action, family fun and of course, entertainment. Kicking off 4th of July weekend, the acclaimed league will yet again open its doors for some of the city’s most elite players and celebrity talent to lace up their sneakers and battle it out on the court for the AEBL championship title. Now in it’s fourth year, AEBL has been the missing link to the local basketball community and the city of Atlanta’s culture. Hundreds of fans and families join together for fun filled games, prizes, food and to cheer on some of their favorite NBA players, local hoop stars and celebrities who attend the league. Two-time champions, Uptown Sounds led by NBA star Lou Williams of the Los Angeles Lakers, are returning to defend their title; alongside of nine additional pro-am teams such as Angel McCoughtry (WNBA, USA Olympic team), TIG (Rich Homie Quan, YF Lucci) and 2 Chainz Street Execs will all be in attendance to take their chance at defeating the AEBL champions. Point 3 Basketball will be providing this season’s gear for each league team, alongside of several other event partners including Gatorade and Kroger. ” I am proud to say that the AEBL has become a household name in summer basketball; we have some of the most talented and electrifying players in the country. Our mission is to continue to give the community a positive summer event that the city of Atlanta can be proud of and continue to support,” AEBL Founder Jah Rawlings states. Being held at the all new North Atlanta High location, AEBL will prove once again just how impactful they are to the basketball culture.